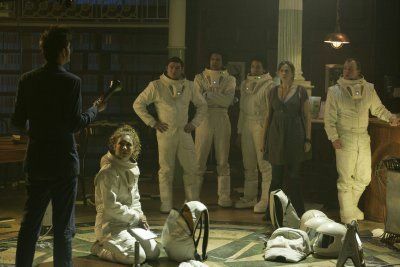 TV REVIEW: Doctor Who 4.8 "Silence in the Library"
The Doctor, Donna and a group of 51st century archaeologists arrive at a giant library where everything’s been a little too quiet for the last 100 years. There’s something nasty lurking in the shadows, and it’s somehow connected with a little girl having nightmares on what appears to be 21st century Earth. After giving an entire generation of kids a phobia of statues with last-year’s Hugo-nominated “Blink”, Who showrunner elect Steven Moffat has now guaranteed they’ll also be sleeping with the lights on. The “count the shadows” theme has the same elegant simplicity as “Blink”’s “don’t look away”, and Moffat once again shows he’s a master at mining maximum chill power from an unseen enemy. The Vashta Nerada may be faceless “piranhas of the air” (aside from when they possess a spacesuit-clad skeleton), but no monster created courtesy of special effects could ever be as creepy as those which Moffat implants in your mind. To say they live in shadows all over the galaxy, even on Earth, might seem a little cruel to this planet’s more impressionable kids, but isn’t that what Doctor Who’s supposed to be about? The intriguing parallel plotline about the nameless little girl telling her psychiatrist Dr Moon (Colin Salmon) about the library in her head - or perhaps, as is hinted in the closing scenes, her world is fiction and the library reality - only serves to emphasise the episode’s claims to being the best of the series so far. The fact that River remembers the Tenth Doctor as an older man suggests there’s plenty of time left for his current incarnation. Having been reduced to a skeleton by those nasty Vashta Nerada, Miss Evangelista (Tallulah Riley) briefly lives on as a “Data Ghost” in her communicator before fading away to nothing. Chilling, heartbreaking (this is one Who death we’re forced to watch in full) and most importantly, a magnificent plot device. The “stay out of the dark” plot device is rather reminiscent of Pitch Black. The Doctor: "I try to keep you away from major plot developments. Which to be honest I seem to be very bad at."